2/18/2017 - EIA's U.S. crude oil production for the week of February 3, 2017 increases to 8.98 million barrels. Crude oil production peaked at 9.6 million barrels/day on July 3, 2015. Crude oil production has been above the 9 million/day range since November 2014. 2017 and 2018 values estimates are updated based on the EIA's January forecast. Crude oil production is expected to be 8.98 million barrels/day in 2017 and 9.53 million barrels/day in 2018. 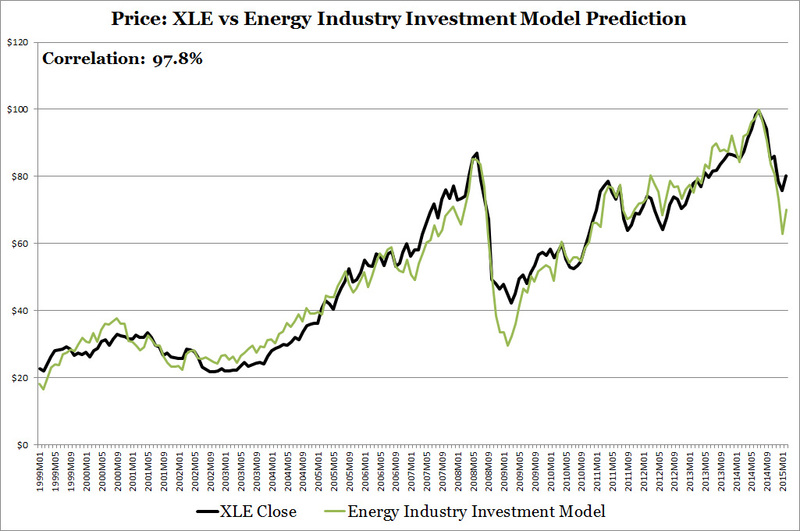 I recommend investors consider use a long term view of XLE and conduct detailed due diligence on any energy stock investment decisions as the short term ride can be quite bumpy. I'm in the process of developing a Stock Market Investment Model which will help estimate stock market performance for the Energy Industry Investment Model. There are more detailed analysis and other energy industry write-ups in my blog entries. The energy industry includes companies that find, drill, and refine oil and natural gas. Examples include Exxon Mobil, Chevron Corporation, and Pioneer Natural Resources. A smaller part of the industry includes companies that provide energy equipment and services such as Schlumberger and Halliburton. This industry is cyclical in nature, rising during economic booms, and falling during economic busts. Model results are updated weekly. Research and reduce significant miss periods seen in backtesting results. (see backtesting section below). Develop a model to help forecast stock market performance. 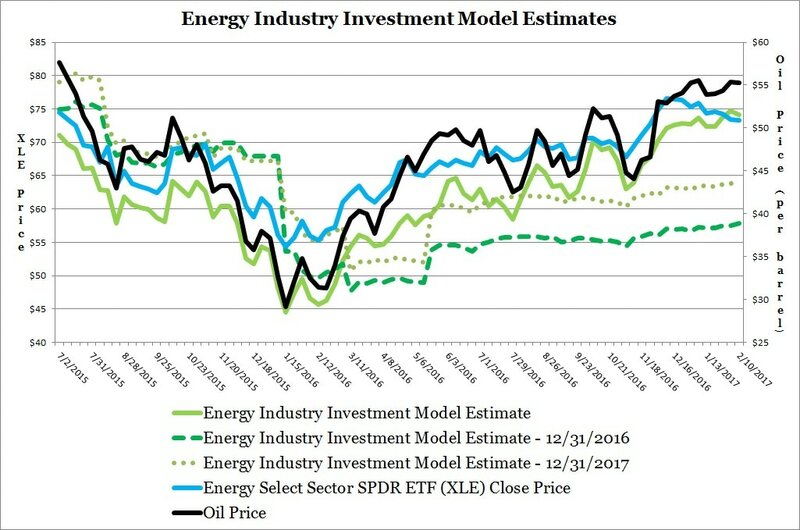 The Energy Industry Investment Model was tested against the Fidelity's Select Energy Portfolio (FSENX) from January 1985 through December 2000. The Fidelity portfolio was chosen because of its long operating history. 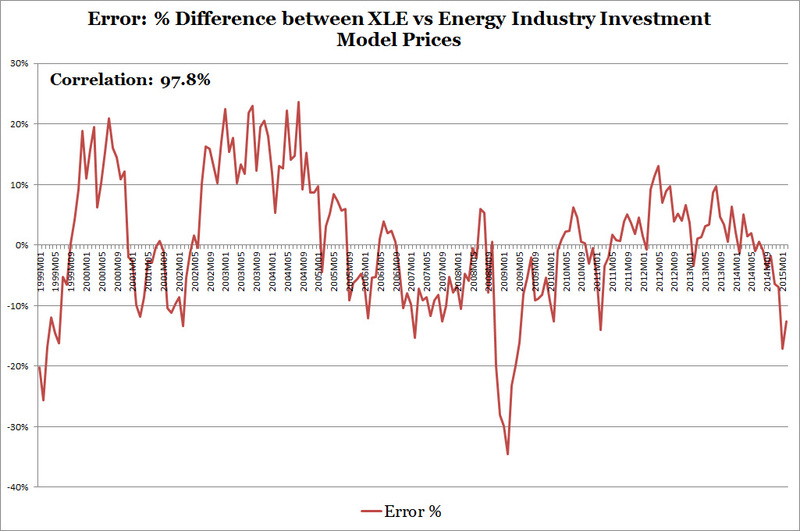 To perform this test, historical fundamental data from January 1985 through December 2000 was used in the model to return FSENX's estimated historical prices. FSENX is a mutual fund whereas XLE is an exchange traded fund. Prices of the exchange traded fund are affected not only by the prices of the securities it holds but by the premium/discount the shares trade relative to the portfolio value. This premium/discount is small. 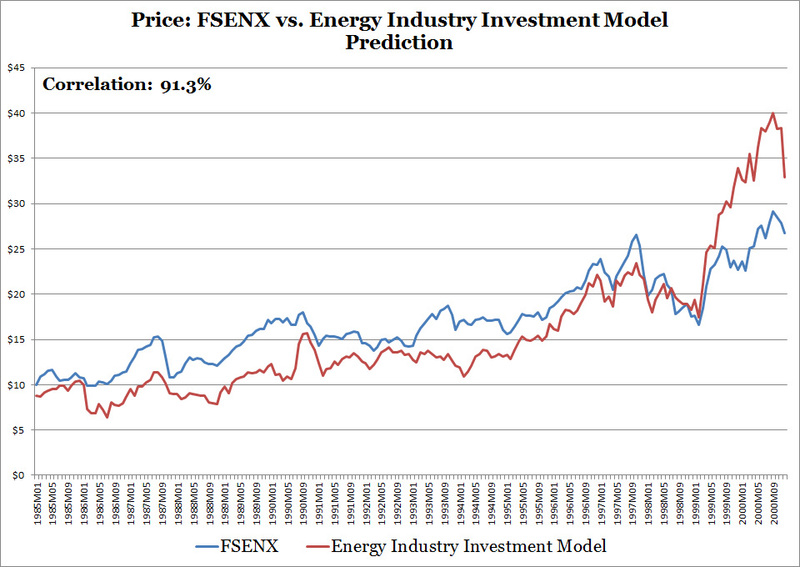 There is a pattern to the energy model misses versus FSENX's price. Modeled results trail FSENX's prices from the 1985 to 1996 before rising above in 1999.